The sweet orange is a flowering tree with glossy, evergreen leaves and thorny branches, and it is probably native to China and the Far East. They now grow all over the world and some of the main producers are Brazil, United States, Spain and Italy. Most of the oranges grown in United States come from Florida and California. This oil is obtained from the peel of the sweet oranges (Citrus sinensis) by cold expression. The oil has a very refreshing sweet, tangy aroma and is deep golden yellow in colour. 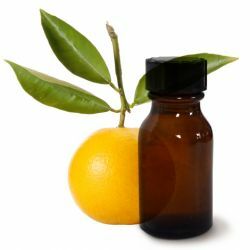 We use Brazilian sweet orange oil and West Indian wild sweet orange oil. This oil is primarily used in the flavour industry for beverages and confectionery. Aromatherapists use it as antidepressant oil and to help boost the immune system. It is recommended generally to uplift the mood and as a cheerful scent for dark winter days. We use sweet orange oil in our Honey Bee Ballistic and Ma Bar Bubble Bar to uplift your spirits as you soak in the bath. Our Soft Coeur, Mange Too, Each Peach (And Two's a Pair massage bars) all have sweet orange oil in their formulae for its sweet, fruity perfume. Oranges and orange blossoms are regarded as highly symbolic in many cultures. Brides have traditionally worn orange blossoms to symbolise fertility. The scent of orange blossoms may also have had calming properties for wedding nerves. The Chinese New year celebrations feature oranges for good luck and prosperity. Catastrophe Cosmetic fresh face mask and Aqua Marina facial cleanser both contain sweet orange oil for its antiseptic and toning qualities. It produces beautifully fragrant white flowers and juicy, orange-coloured fruits. The fruits are actually a type of berry called hesperidium.